Services at Eagle Alloy start at the very beginning of the casting process. Our engineering teams routinely work with customers early in the design stages on larger, long-term projects, providing our expert casting and machining advice to ensure parts are designed for manufacturability (DFM). The outcome is a part that performs to the standards our customers require and is produced as cost effectively as possible. It is true value engineering (VE). This process is the industry standard for medium to high volume, commercial grade casting projects. For a better look at how the process works, we offer a video animation. Or, learn more by reading our Shell Molding Process Guide. In the shell mold casting process, thermally bonded sand is applied to the surface of a pre-heated pattern usually made of cast iron or steel. The “baked” mold is lifted from the pattern in halves. The halves are glued together, assisted by precise locating features to avoid shifting. The Shell process offers tolerances of +/-.030” on dimensions 6” or less and a surface finish around 150 – 300 RMS. Click here for a complete description of available tolerances, radii, fillets and other design considerations. Advantages: good casting detail, excellent repeatability, very productive, less machine stock required than in greensand or no-bake processes, competitive pound-prices, very short production lead times. Disadvantages: tooling prices higher than some other processes. Airset casting, also known as no-bake casting, utilizes molds and cores made of bonded sand. Unlike shell molds, airset molds do not need to be heated to set. Though not as precise as shell molding, the airset process is known for its versatility, and can still produce comparatively complex parts. Our engineering team can work with you to develop a prototype part from inception all the way to a production casting. With the advantage of 3D-printed molds and cores, designs are able to be changed “on the fly”. This allows any flaws in the casting design to be worked out beforehand, thus avoiding expensive tooling changes down the road. Eagle Alloy outsources its 3D printing to various pattern and machine shops to create the 3D printed sand cores/molds. We are then able to pour, process, and heat treat the castings to meet your requirements. Check out the 3D-printed molding slide show. From beginning to end, our Sales, Quality, Engineering and Production staffs have the ability to help you design, produce and sustain a product that is perfect for the application. Casting, heat treating, machining and painting are all standard practices here at The Eagle Group. We even have sources for passivation, induction hardening and flame hardening. It’s all in a day’s work. We can help you identify and minimize the cost-drivers in your project and then develop and deliver that project within some of the shortest and most consistent lead times in the industry. We are committed to working with our customers to provide them with a high value part that performs consistently and exceeds expectations. We evaluate part design for the most effective casting design that will allow us to utilize the unique capabilities of the shell mold process to deliver the best casting consistently on time. Our rigorous Advanced Quality Planning (AQP) process, with its “you can’t fool physics” approach, requires us to look at the processing and use of the end product to insure that potential issues are identified and resolved before tooling is even started. We evaluate all metallurgical, testing, dimensional, etc. requirements for parts to insure all aspects are covered. Concurrently utilizing our 3D CAD and MAGMA solidification software, we are able to provide design change proposals, if needed, to the customer to maximize the part value and insure we get the part right the first time. We also coordinate with the machining to insure that the casting, when processed, will perform correctly. Initial samples are run on production equipment with production personnel providing input and analysis to insure parts are ready to run after approval. Our AQP process extends through sampling to MRB review and approval and First Production Run evaluation. We utilize both traditional measurement equipment such as micrometers, height gages, calipers, depth gages, etc., as well as, state of the art CMM and laser scanning to check both samples and productions parts. We use specifically designed go/no-go gages to confirm dimensional requirements on critical features and dimensions on production parts. For Coordinate Measuring Machine (CMM) requirements, we utilize local outsource shops that specialize in CMM programming and reports. 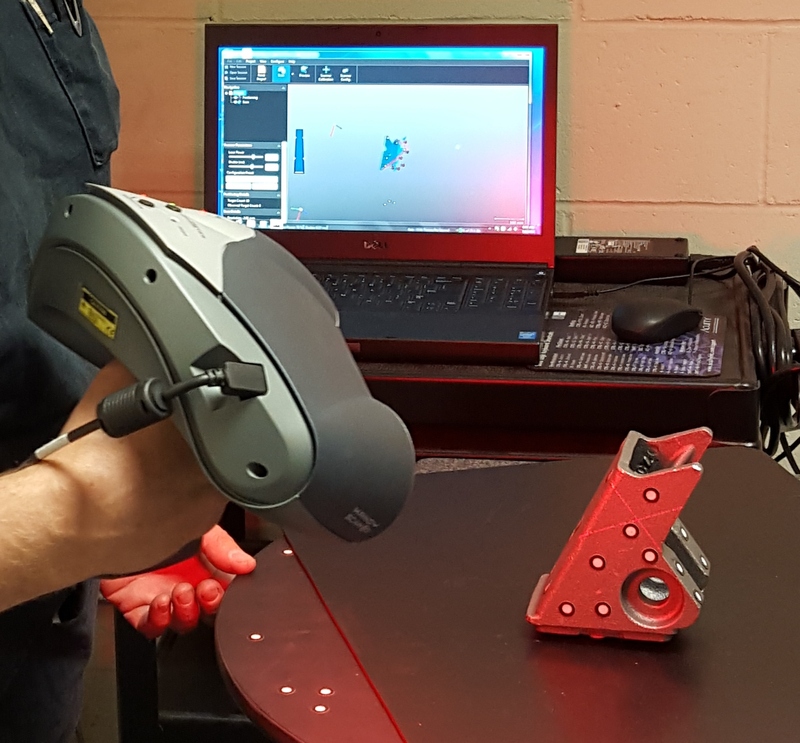 We also utilize a high resolution Creaform Exascan 3-Dimensional laser scanner to measure and confirm product dimensions on first articles to within +/-0.0008″. The scanner can also be utilized if trouble-shooting or reverse-engineering assistance is required. Utilizing Geomagic Verify with the scan data allows us to conduct inspection of critical features, and also allows us to directly compare all of a parts casting features to the original solid model design to easily identify inconsistencies in the final product that may be detrimental to the product’s application. We can also share scan files with our sister machine shop and customers for analysis.